Just received this postcard in the mail from my cousin and his girlfriend in Germany. They live in Nürnberg, or Nuremberg, and just love the city. When they were here over the summer they told us about the gorgeous Christkindlesmarkt, or Christmas Market, held every December in the large market square. About 180 beautifully decorated wooden stalls sell gingerbread, baked goods, wood-carved Christmas wares, ornaments, and crafts, including the well-known "Nuremberg Plum People," little figures made from prunes. The Christmas market draws well over a million visitors every year. That looks beautiful! I hate shopping, but I'd probably go spend a (very) little bit of time there just to walk around. What a great atmosphere it must be. It looks so beautiful - this is why I want to go to a European Christmas market! 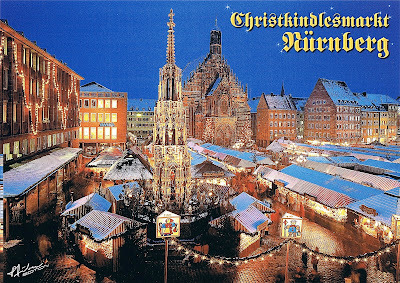 I went to the Nuremberg Christmas market a couple of weeks ago. It was beautiful and very traditional. I loved it! Great post. This will be useful for me. Thanks for sharing this. I will revisit this site soon. We went to the Nuremberg Christmas Market three years ago. It was beautiful. You don't need to shop to enjoy the atmosphere. Sipping gluhwein on a cold winters night in a beautiful, medieval market square is unforgettable. My then-nine-year-old son loved it as well.